HAS YOUR MIND BEEN HACKED? LONDON (22, August 2017) – Film Mode Entertainment is pleased to announce the 2017 FRIGHTFEST Premiere of Sci-Fi Thriller MINDHACK: #savetheworld. The film stars Spencer Locke (TARZAN), Faran Tahir (IRON MAN), Scott Mechlowicz (DEMONIC) and Chris Mason (BETWEEN TWO WORLDS) and is commercial director Royce Gorsuch’s feature directorial debut. ”We were blown away by the originality and timeliness of Royce’s directorial debut. This is one of the most creative and commercially relevant films in the marketplace that knows exactly who its audience is; Millennials and Gen Z” Said Clay Epstein, President of Film Mode Entertainment. MINDHACK: #savetheworld is an action-packed sci-fi thriller about a brilliant scientist on a mission to hack into the human mind in order to save humanity from its own catastrophic errors. Once he begins work on the controversial project, there is no stopping him as he is pushed to do whatever is necessary to accomplish his mission. The film comes at an extremely poignant and timely juncture where hacking has taken the world by storm, from governments and other sources hacking into the systems of their adversaries to actual mind hacking incidents throughout the Silicon Valley and elsewhere throughout the world. Major news outlets including The Telegraph, Yahoo News and others have been reporting on how scientists have discovered how to upload knowledge to the human brain. Additionally, there is scientific evidence noted in articles in these media outlets and many more that “mind-hacking” has been going on since ancient Egypt. Never in the history of the human race has there been such rampant hacking. "This film was born from the exponentially evolving technological world we now live in and tells the paradoxical story of a generation who can currently change the world from their computers, and in the future will change the world by enhancing the power of the human mind. It was incredible to see the cast not only grasp these far reaching concepts of the film, but bring it to life with incredibly thrilling and emotionally charged performances. We assembled a team of geniuses to execute film, and we are thrilled to now partner with Clay Epstein and his team of geniuses for its release." Said Gorsuch. FRIGHTFEST reported on MINDHACK: A brilliant scientist is on a mission to hack the human mind to save humanity from its own catastrophic errors and is pushed to do whatever is necessary to complete the assignment. An extraordinary visionary experience about the inner conflicts of being a culture-jamming creator, director Royce Gorsuch’s kaleidoscopic mindbender is an astonishingly visual tour de force about the cacophony of voices in our heads pushing us, confusing us, mixing signals, the ego, reason, and the mistaken evils which might come from accomplishing the goal. An inner space odyssey through reconciliation, forgiveness and self-sacrifice for the greater good. The film was produced by VIX PROD. CO.
Spencer Locke is represented by Paradigm, Faran Tahir by Greene & Associates, Scott Mechlowicz also by Greene & Associates, Chris Mason by 3 Arts / UTA / United Agents UK, Gbenga Akinnagbe by APA and Brandon Scott by Innovative Artists. 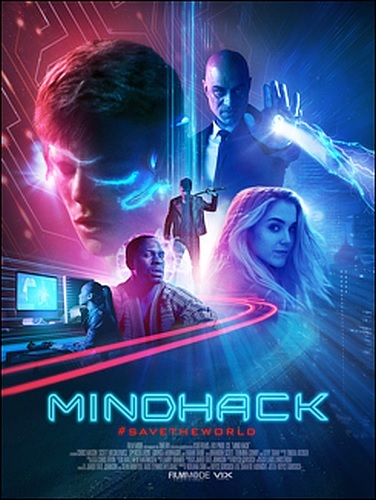 Clay Epstein’s Film Mode Entertainment is representing worldwide rights on MINDHACK: #savetheworld. Lon Haber & Co is handling PR for the film, and for Film Mode Entertainment. Film Mode Entertainment is a leading worldwide sales agent and production entity, focusing on commercially driven feature films of all genres and budget sizes. Film Mode represents projects at all stages of the filmmaking process, often as Executive Producer, with the aim of helping our producers and distributors achieve maximum exposure for their films. Film Mode’s recent successes include SUGAR MOUNTAIN starring Jason Momoa, LITTLE PINK HOUSE starring two time, Academy Award nominatee, Catherine Keener and the SXSW official entry, THE GOOD NEIGHBOR starring the legendary Academy Award nominee James Caan. Upcoming productions include VIKING DESTINY starring Academy Award nominee Terence Stamp. In 2017, Film Mode launched DocMode to focus on award winning Documentaries that impact the world. Film Mode is based in Beverly Hills, CA. with a satellite office in New York City.